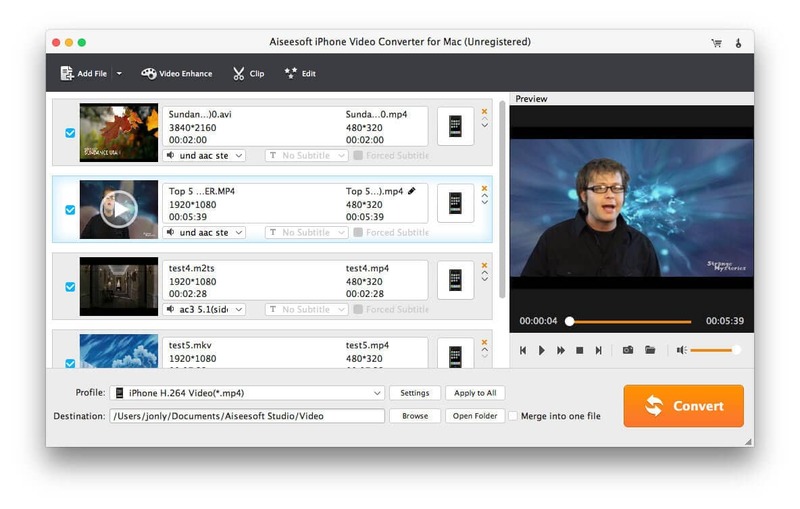 Aiseesoft iPhone Video Converter for Mac is a professional Mac iPhone Converter, which can convert MPG, MPEG, MPEG2, VOB, MP4, M4V, RM, RMVB, WMV, ASF, MKV, TS, MPV, AVI, 3GP, 3G2, FLV, MOD, TOD, HD video and other popular video formats to iPhone MPEG-4, H.264/MPEG-4 AVC on Mac. Also this iPhone Video Converter for Mac owns powerful video editing features. Moreover, it supports all iPhone versions (including the new iPhone 5s/5c). This powerful Aiseesoft iPhone Video Converter for Mac has the ability to output different formats at a time. You can get any clip from the source file exactly by setting the start and end time or just dragging the slider bar. Adjust the video aspect ratio to fit for your player screen to get the perfect effect. This Mac iPhone converter provides you the function of merging all the files you choose into one output file. Using this Aiseesoft iPhone Video Converter for Mac, you can choose pictures, texts or images as you like to experience a colorful life. You can select your favorite subtitle and audio track to quicken your operation. More settings are for you to adjust: Brightness, Contrast, Saturation and Volume. For your interlaced video, just check Deinterlacing to avoid mosaic. More output parameters are provided for you to adjust: Video Encoder, Resolution, Frame Rate, Video Bitrate, Audio Encoder, Sample Rate, Channels, Audio Bitrate. For Resolution, if the pre-set cannot meet your needs, just input your own parameter. For the well-customized profile, you can save it as &quot;User-Defined&quot; profile for your later direct use.